Fleetwood booked their place in the second round of the FA Cup with victory at Conference North side Gloucester. David Ball gave the Cod Army an early lead when his tame effort from outside the area beat unsighted Gloucester keeper Mike Green. Steven Schumacher hit the post from the penalty spot after Ball was tripped. Gloucester forced a good save from Scott Davies as Tyler Weir burst into the box, but Jon Parkin wrapped up the win by rounding Green and tapping home. "I thought we did well in patches and were frustrating in others. "You're never going to dominate a game for 90 minutes, no matter who you're playing. To be fair to Gloucester, they gave it a right good go and credit to them. "We missed a couple of good chances to extend our lead and, if we'd done that, it might have been an easier afternoon for us." Match ends, Gloucester City 0, Fleetwood Town 2. Second Half ends, Gloucester City 0, Fleetwood Town 2. Attempt saved. Jeff Hughes (Fleetwood Town) left footed shot from outside the box is saved in the centre of the goal. Assisted by Stewart Murdoch. Charlie Taylor (Fleetwood Town) wins a free kick in the defensive half. Foul by Joe Parker (Gloucester City). Attempt missed. Jeff Hughes (Fleetwood Town) left footed shot from outside the box is high and wide to the left. Assisted by Conor McLaughlin. Attempt blocked. Jon Parkin (Fleetwood Town) right footed shot from the centre of the box is blocked. Assisted by Jeff Hughes. Substitution, Fleetwood Town. Junior Brown replaces Gareth Evans. Substitution, Fleetwood Town. Matty Blair replaces David Ball. Goal! Gloucester City 0, Fleetwood Town 2. 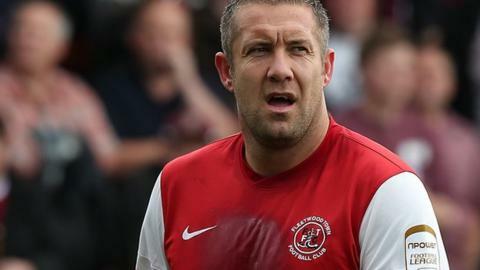 Jon Parkin (Fleetwood Town) right footed shot from the right side of the box to the bottom right corner. Assisted by Stewart Murdoch. Hand ball by David Ball (Fleetwood Town). Attempt saved. Gareth Evans (Fleetwood Town) right footed shot from the centre of the box is saved in the centre of the goal. Assisted by Jon Parkin. Attempt saved. Darren Edwards (Gloucester City) right footed shot from the left side of the box is saved in the bottom right corner. Substitution, Gloucester City. Will Morford replaces Michael Green. Attempt blocked. Steven Schumacher (Fleetwood Town) right footed shot from outside the box is blocked. Assisted by Charlie Taylor. David Ball (Fleetwood Town) wins a free kick in the attacking half. Foul by Jack Harris (Gloucester City). Jon Parkin (Fleetwood Town) is shown the yellow card. Matt Coupe (Gloucester City) wins a free kick in the defensive half. Attempt saved. Darren Edwards (Gloucester City) right footed shot from outside the box is saved in the bottom left corner. Assisted by Matt Groves. Corner, Fleetwood Town. Conceded by Jordan Goddard. Corner, Fleetwood Town. Conceded by Jack Harris. Attempt blocked. Jon Parkin (Fleetwood Town) right footed shot from a difficult angle on the right is blocked. Assisted by David Ball. Joe Parker (Gloucester City) wins a free kick in the defensive half. Substitution, Gloucester City. Matt Groves replaces Scott Wilson. Substitution, Fleetwood Town. Jon Parkin replaces Antoni Sarcevic. Attempt missed. Stewart Murdoch (Fleetwood Town) right footed shot from more than 35 yards misses to the left. Assisted by Steven Schumacher. Corner, Gloucester City. Conceded by Conor McLaughlin. Corner, Gloucester City. Conceded by Mark Roberts. Offside, Fleetwood Town. Steven Schumacher tries a through ball, but Charlie Taylor is caught offside. Jordan Goddard (Gloucester City) is shown the yellow card for a bad foul. Foul by Jordan Goddard (Gloucester City). Attempt missed. David Ball (Fleetwood Town) header from the left side of the six yard box is high and wide to the right. Assisted by Steven Schumacher with a cross following a corner. Corner, Fleetwood Town. Conceded by Michael Green.